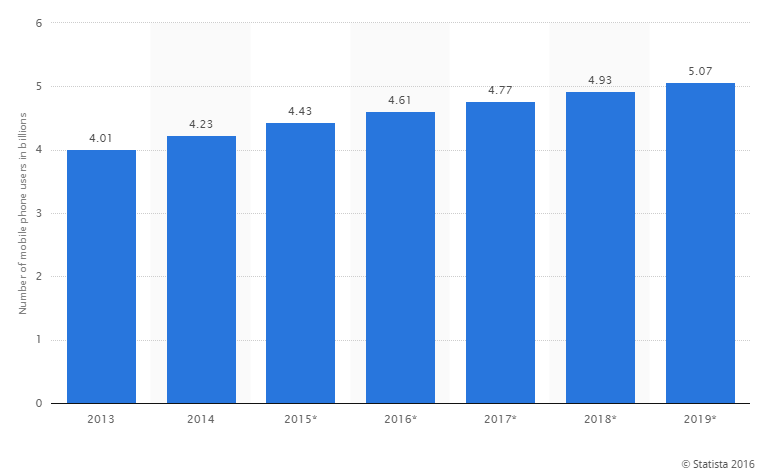 You already know it is time to get serious about mobile (especially if you are marketers) when over a half of the world’s population is using mobile phones. In 2014, nearly 60 % of world population was using a mobile phone. The number is expected to reach 67 % by the end of 2019. Figuratively, it means nearly 5 billion! But how has mobile been so different and disruptive? A presentation delivered by Benedict Evans at The Guardian's Changing Media Summit answers the question. It took three decades for the personal computers to go from 9 million units to 300 million units. And in that period and era, it was phenomenal. The launch of mobile phones was equally phenomenal. But it was different from PCs. They were not about computing or solving your day-to-day problems. They were simply for communication. The advent of smartphone, however, broke that wall. It all started with an iPhone and took less than a decade to reach a sale of 1.5 billion smartphones. The numbers are still growing. And if you include tablets, it adds up another quarter billion. Mobile is the first universal tech product. No tech product was ever so popular in the human history than the smartphones. Computers were revolutionary, but they still didn’t reach the masses the way smartphones did. Smartphones, even though in a sense they are mobile phones, have outperformed the Java-based keypads phone. What made smartphones the universal tech product? Smartphone and the mobile networks, which drive the purpose of smartphones, have penetrated areas where electricity, safe water, and other basic infrastructure like roads have failed to reach. From the remote villages in India to the deep deserts of Africa, mobile has made its presence everywhere. An entry level smartphone costs less than $50 USD, making it easier to own one. And considering the advantages of a smartphone, the price is dwarfed. The only barrier to using smartphone is the data barrier and power. It has penetrated every corporation, every home, every desk, and almost every pocket. Technology develops in a specific ecosystem. The ecosystem changes from time-to-time. Benedict Evans says that technology develops after adapting one ecosystem after another technology develops. Each new ecosystem is a change in scale. It is the ecosystem which is the center of innovation and investment for that generation. Mobile has scale for everyone on earth. A mainframe computer was adapted by 100 thousand devices. Workstations by 10 million people. And PCs were adapted by 1.5 billion people. But mobile? It has reached beyond 5 billion. It is the first technology product in the human history which has been adapted by almost everyone on earth. And each person purchases a new mobile phone every 2-3 years. Those who have felt mobile is merely a screen with a lot of connectivity options needs to change their perspective. Mobile is an ecosystem. The shift from PC to mobile isn’t screen size or keyword. Those are just options. This is a shift in the scale—a shift of 10x. Most innovative products in the market—from the drones to IoT devices to virtual reality products — all are made up of smartphone components. For example, what is a drone but a smartphone that flies? Its most important components are smartphones performing specialized tasks. Google’s Project Ara is another perfect example of how mobile is creating a whole new ecosystem. We all know how one device has been replacing another. Workstations replaced mainframes. PCs replaced workstations. And then, mobile replaced PCs. Is this new change like the one happened earlier? Is it simply progress in computing? Technology tools also affect the way we work. First, you make the new tools fit into the old way of working. Over time, the work changes to fit the new tools. 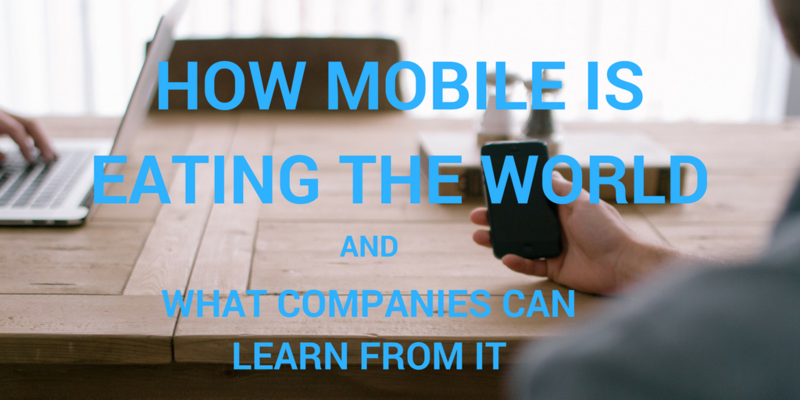 The most amazing aspect of mobile has been its effect on the way we worked. Not only has it made it faster with high speed internet access but it has also made it easier to work from any location in the world. Cloud, AI, and mobile devices are driving new tools and new workflows. It is changing the way businesses perform and organize tasks. The start of the 21st century marked the start of new era. Increase in internet speed, ecommerce and online ad spending was getting a boost. Since 1999, US ecommerce + online ad revenue has increased almost 15 times. However, the increase in online ad spends got a new life with mobile phones. All those ecommerce purchases for which people had to sit in front of a PC can now be done on their smartphones while they reclined on the living room couch or while traveling or even while sipping coffee at Starbucks. Mobile is already contributing half of ecommerce traffic and one-third of the revenue. All because internet had moved to mobile. Even for getting social or chatting with friends, people were now using internet on their phones. Astonishingly, people are not using smartphones only when they are mobile. Most of them are using in their homes or offices. 40-50% of smartphone traffic happens on WiFi. A BBC video requests by platform suggests that in the living rooms, the TV, consoles, PCs, and STBs are going in the background. BBC is getting 19% video requests from smartphones and 22% from tablets. Mobile is not what it used to be two decades back. It is more sophisticated, more capable, and in some cases, even better than laptops and PCs. It’s personal, works with touch, has sensors, cameras, location-based apps that helps you do everything from shopping to finding the nearest restaurant, assists in payments, and get social. Even this list is just a small part of what mobiles are capable of doing. For marketers, understanding the gravity of these changes is a gold rush. For 20 years, accessing internet meant PC, browser, mouse, and keyboard. If you want to listen to music online, it also meant additional speakers. Sometimes even mic as well. All search and web apps needed these devices to make the “internet” happen! With mobile, especially the smartphones, the web was unbundled into apps, apps into operating systems, and made everything possible with a single device. And it didn’t stop there. It kept on improving—in design, UX, and most importantly, speed with the onset of 3G and 4G technologies. This fundamental shift in behavior from desktop to mobile apps is so magnanimous that apps are accounting for over half of the internet use according to a Comscore data. A third of mobile app use is Facebook which in itself is a mobile web browser. If you count Facebook and other social apps as mobile web traffic, the overall mobile web traffic could almost be doubled. However, nothing is yet settled. With devices like smart watches, Amzon Echo, and other wearable technologies making space in the market, it is difficult to say what will ensue in the next 5 years. Another amazing thing about this smartphone and internet amalgam is that it is creating new routes to market. It also means that the customers have a lot of options to choose from. Facebook and its other services like Messenger, WhatsApp, and Instagram together have more users than iOS and Google Android combined. These new routes to market is also creating new models for both content and distribution. The content model for Instagram and Snapchat is completely different. On YouTube, it takes a different look altogether. It suggests that we firstly unbundled the web into apps. Now, we are trying to unbundle and rebundle again the apps into web and vice versa. The idea is to create new ways to provide services focusing on new ways to acquire users. While earlier, people relied on using Google ad services to install their apps, now they are using Facebook to get the same job done. The fundamental is also the same. You always have to pay to reach customers. It’s only the platform we use will keep on changing. As a marketer, all you need to do is understand who has the traffic and to whom do they give it? Many newspapers and print media companies have thought that with the onset of the internet and easier and faster information distribution, printing costs would fall. But with time, they understood that the internet and the mobile technologies were changing the way people consumed content and interacted with it. When the channel and route to market changes, your business has to change too.